Four classy holiday villas with unique architecture, in which the Portuguese style is in harmony with the modern interior. Every house has a spacious sundeck and a magnificent swimming pool. 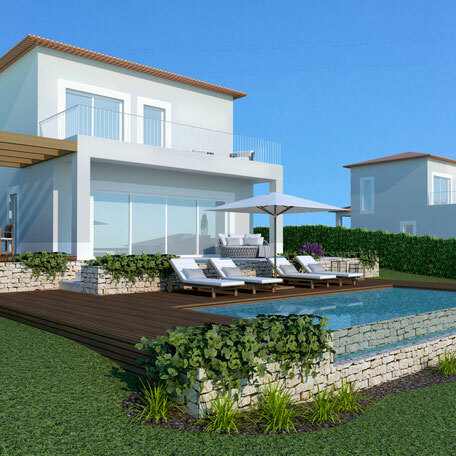 The project Jardins do Atlântico has four charming holiday villas and is located in Casais da Boavista, 500 meters from the Atlantic Ocean and right in between the fashionable Foz do Arelho and the charming São Martinho do Porto. The site lends itself perfectly to southern-oriented houses with a view. Each villa has its own unique architecture. The emphasis is on classy simplicity, with an elegant Portuguese style on the outside and a modern interior. Large windows provide abundant light. It is also pleasant outside. Each house has a spacious private garden with ample parking, several terraces, a nice swimming pool and Portuguese fauna and flora. The private road is only accessible for the four properties, which ensures quiet and privacy. More and more non-Portuguese people find their way to Portugal. Not only the rich culture, the impressive nature, the honest kitchen and the hospitality of the population, but also a favorable taxation lie at the basis of this. Jardins do Atlântico is located in the Estremadura region. Capital Lisbon, cultural cities of Sintra, Mafra, Obidos, Peniche, Nazaré, Foz do Arelho, São Martinho do Porto, the long coastline, the various national parks: these are just some of the region's many assets. Where people in the past ignored Estremadura, nowadays it shouldn't be missing in a Portugal trip worthy of the name. The houses are built at different heights, of which the privacy can benefit. Large windows provide abundant light. Every house has its own architecture, the style is contemporary Portuguese. Jardins do Atlântico is so much more than the umpteenth building project. The houses are planted at different heights in the naturally undulating terrain, which ensures privacy. Each villa has its own Portuguese architecture, adapted to its embedding in the whole. The landscape architect integrates an authentic waterway in the gardens. Typical Portuguese fauna and flora sculpter the whole, with an eye for the complete privacy of every property. 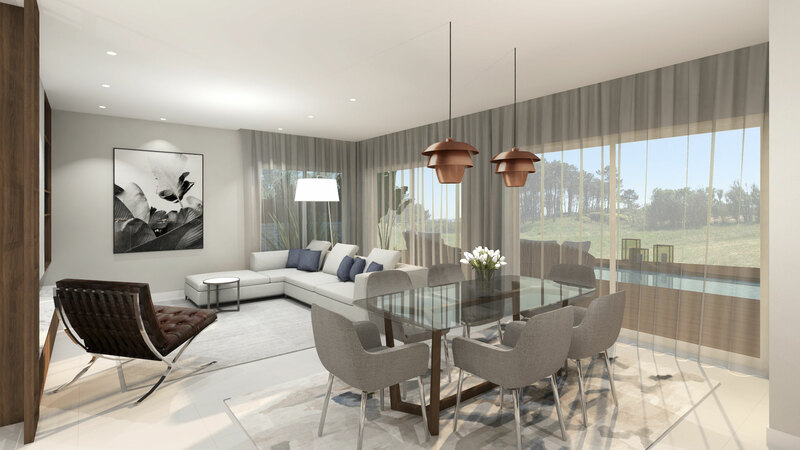 Each house has three to four bedrooms, two bathrooms, a spacious living room, an open kitchen. Each garden contains a spacious driveway, several terraces and a private swimming pool. The choice of materials emphasizes quality, the finish is high-quality and has an eye for detail. We use as many Portuguese materials as possible and work exclusively with Portuguese craftsmen. The prices start at € 350,000 including VAT. 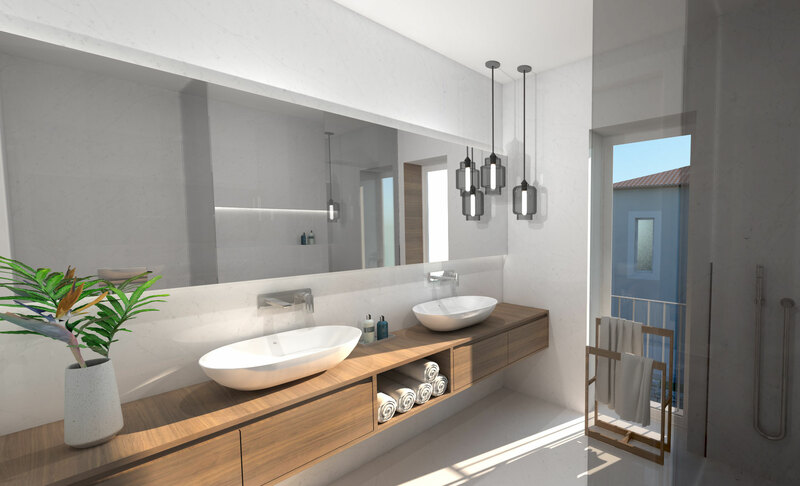 For this you get a fully finished house, with fully equipped kitchen, bathrooms with custom made cabinets from walnut, air conditioning in living room and bedrooms, electric shutters, landscaped garden with driveway and private swimming pool. Impression of a living room. The large windows ensure abundant light. In this region the demand for holiday homes during the summer months is much larger than the supply, which ensures a good return on investment. The project is easily manageable with four houses. Personal guidance is guaranteed until even after the final delivery: your satisfaction is the most important thing. An extremely solid and aesthetic finish is included in the price. Within this broad budget you are free to choose for other colors or materials. In this way we guarantee you the home of your dreams, without surprises. 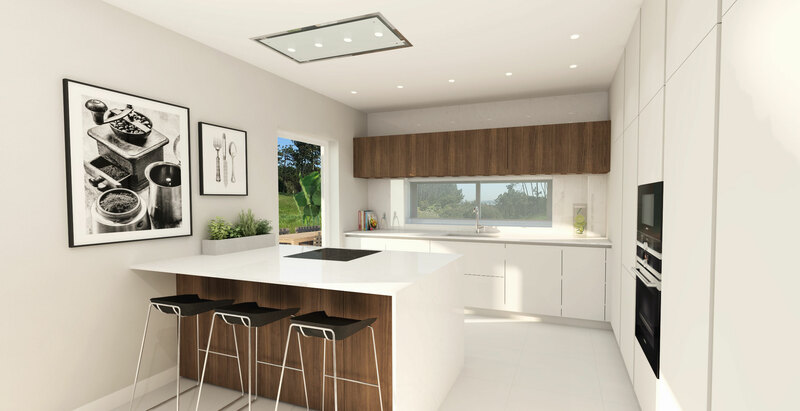 The kitchen is modern and spacious, with sufficient cupboards. The bathroom with walk-in shower combines simplicity with class. 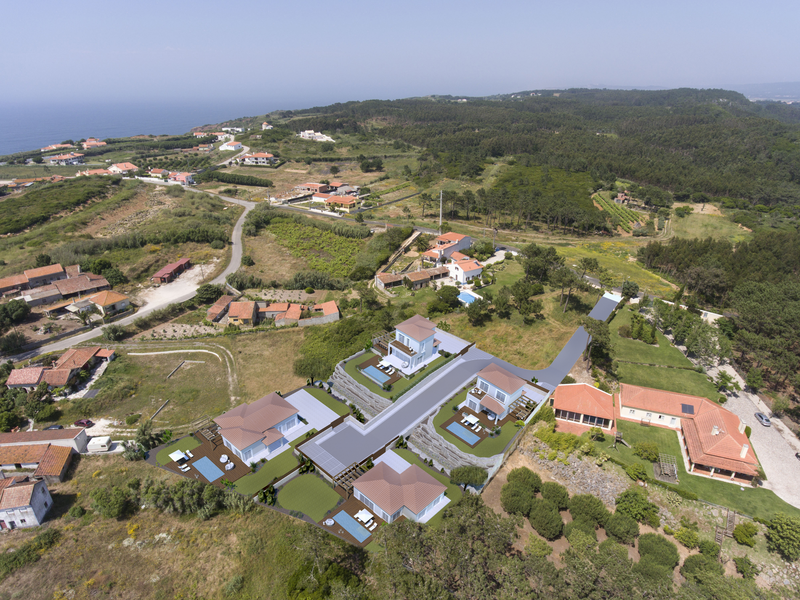 The project is located less than 500 meters from the Atlantic Ocean. Close the eyes and enjoy the roaring of the sea.